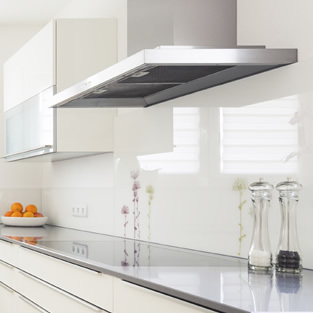 As the North West’s leading manufacturer of Kitchen Splashbacks, All Glass and Glazing has the products that impress at prices that delight. An absolute essential for the busy modern kitchen, splash backs combine outstanding protection with a genuinely impressive aesthetic enhancement. Designed to protect the walls in key areas with robust, durable, hygienic and easy-to-clean materials, kitchen splash backs go one step further than any standard wall covering ever could. The real beauty of the modern glass splash backs is that with no space between tiles or grouting required, there’s no place for germs, bacteria or general grease and grime to hide and accumulate. In terms of keeping the kitchen sanitary therefore, splash backs really are in a league of their own. In a practical capacity, splash backs are brilliantly suited for use anywhere in the kitchen prone to spills, splashes and general day-to-day punishment. Superbly scratch-resistant, built to withstand even the most extreme temperatures and capable of taking more than the odd knock here and there, protection for the walls of your kitchen simply doesn’t come any more capable than this. The list goes on – suffice to say it’s a small change to the kitchen that adds up to an enormous difference! As all Glass and Glazing manufactures every kitchen splash back to order, we’re able to produce goods that fit your needs and your budget with flawless precision. Just let us know the size, thickness and colour of your choosing – we’ll get to work creating the most outstanding splash back for the lowest possible price. For more information on the splash backs we offer or to discuss a quotation, give the All Glass and Glazing team a call today on 0161 427 7800.